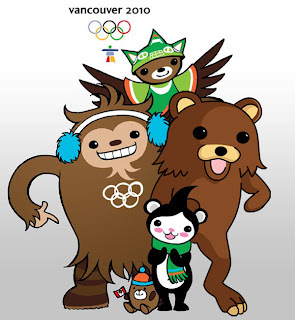 The 2010 Vancouver Winter Olympics start this Friday! As any good Canuck knows, the Winter Olympics are the important Olympics, and as such, want to see Canada rake in the medals, especially with the home advantage. Now, if you are living in Portugal, the Winter Olympics rarely make the news, seeing as how winter sports are practically impossible here due to the good weather, and because Portugal has only one athlete in the Winter Olympics (Danny Silva, the only amateur athlete at the Games... that's determination!). What is the best way to follow the Olympics in Portugal, if you don't have cable TV, you may ask? Going to a pub is not an option, since with the time difference, they would be closed, and with the little interest in the winter games, they would probably have it on VH1 or SportTv. Well, the internet of course! The Official 2010 Vancouver Olympics website has a listing of on-line coverage. Very, very handy. I recommend checking out the official website, you can follow Olympic news on Twitter, become a Facebook fan, see the schedules, etc. The Opening Ceremony is set to start at 2:00AM on the 13th of February here in Portugal (6:00PM on the 12th in Vancouver), don't miss it! wished about this and didn’t know who to ask. Glimpse here, and also you’ll definitely discover it.